Sunday night officially signaled the end of the NFL, the most watched sport in America. If you are just starting to follow the NBA season after the NFL’s closure, you’ve missed out on a lot. As CBS cameras caught Joe Flacco saying Sunday night, this NBA season has been “f—ing awesome!” In case you were wondering though, LeBron James is still the best player in the NBA. The Heat took a later flight from Toronto so they wouldn’t miss the Super Bowl but you wouldn’t have known watching James on Monday night. LeBron dominated the Charlotte Bobcats going an insane 13-14 from the field and played with so much energy you would have thought that American Airlines Arena might experience a blackout. As if shooting a career high percentage wasn’t enough, LeBron tallied up 8 boards, 8 assists, and 2 steals to go along with it. It’s just another milestone for LeBron James, and a performance we’ve grown used too. So for all you NFL fans, who only follow basketball once the NFL season is over, welcome to the LeBron James show. LeBron has put up such ridiculous lines so consistently over the years that we have become accustomed to his greatness. It’s like when you go see a movie with Daniel Day Lewis, if it’s not in the running for best picture, then it’s a letdown. We only expect the best. Critics of LeBron always brought up his inability to play in the post (which he’s fixed), disappearing at the end of games (also been fixed) and his poor handling of The Decision and assumption of the role of villain. When I saw this happen, it became clear that LeBron is no longer the villain many once considered him. That is LeBron James emotionally celebrating the unlikely success of a man who just won $75,000 hitting a half-court hook shot during the game. James was absolutely thrilled for the good fortune of another — a villain wouldn’t be thrilled. We do not expect NBA players to get so giddy and excited that they jump on another man during a NBA game. That’s LeBron though. He continually does things we don’t expect any NBA player to do and he mesmerizes us. The scariest thing about LeBron is not only has he continued matching our expectations of him, but he’s exceeding them. LeBron is like the flu. Every year opposing teams and coaches know that LeBron is going to do some damage and you can take precautions and try to contain him (similar to getting the flu shot), but he’s still going to ruin a good amount of people’s day. You look forward to flu season ending and being healthy, but you know that next year it’s only going to come back stronger and you’re going to have to deal with the whole scenario again. LeBron James’ fountain of basketball greatness seems never ending as he has again increased his efficiency again during the offseason. With the All-Star break coming up, LeBron is shooting a career-high 55 percent from the field. That’s better than what Lakers’ star Dwight Howard or Atlanta’s Josh Smith can shoot from the free-throw line. Throw this in with a 40 percent success rate from the three, a career low 2.8 turnovers and LeBron is having the most efficient season of his career. With this efficiency has come production as LeBron averages 26 PPG, 8 RPG, 7 APG. The only thing receding about LeBron is his hairline and I think he’ll accept that as long as his game improves. The king is fighting to keep his crown with a growing Kevin Durant chasing him (which will be one of the greatest rivalries of the next decade), but the reigning MVP is proving why he’s considered the best basketball player on the planet. He can distribute the ball like a point guard, score like a shooting guard, or post up underneath the basket like a power forward. Along with all of this, he’s too big to be defended by a traditional guard and he’s too fast to be matched against a power forward or center. 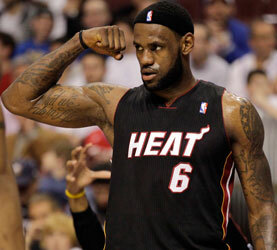 He’s the hybrid, power point guard, basketball monster that can only be described as LeBron. He’s a dominant physical specimen with an extremely developed basketball IQ. It’s like facing a big, extremely athletic Chris Paul nightly. He never stops getting better. Critique something about him or his game, he’ll spend the next summer making sure the fault doesn’t exist. LeBron has even been able to improve his likeability this year. While rated sixth on Forbes’ 2012 list of most hated athletes, everyone knows that Lance Armstrong will dominate the list next year. As long as LeBron doesn’t get busted for PEDs or marry a Kardashian, he’s looking at seventh place in a worst-case scenario. Beyond his ridiculous efficiency and averages, LeBron has hit some notable milestones this season. LeBron began this season by scoring 20 or more points in the first 33 games of the season. He is only the second player to have achieved this since the 1976 NBA merger, only trailing George Gervin’s 45-game streak. What’s most impressive about this? If you go back to last season, the last game he scored fewer than 20 points was April 13 against the Bobcats when he registered 19 points. After that game, LeBron scored 20 or more points in the next 54 games when including last year’s postseason. The guy operates so consistently that he seems more like a machine than man. This consistency allowed him to become the youngest player to 20,000 points and in LeBronian fashion, he dished his 5,000th assist that same game. For LeBron, one milestone just isn’t enough. That seems to be the story of LeBron’s career — it’s never enough. A championship, a finals MVP, 3 regular season MVPs and two Olympic golds isn’t enough. He consistently improves his play, maturity and ever-growing legend each year. He’s someone who is constantly pushing himself to get better and has developed into someone who can play or defend any position on the court. He’s by far the best and most complete player. When the other teams only hope to stop you is by you stopping yourself and having an off night, you’ve reached a special level. LeBron is looking at a fourth MVP, another NBA finals appearance and a chance to further his legacy. I’m petitioning to make 2 Chainz poetic “I’m Diffrent” the theme song of LeBron James since no song could describe him better -“I’m different, yeah I’m different, pull up to the scene with my ceiling missing, middle finga up to my competition!” LeBron James is different than any other player in the league and his greatness has no ceiling. If you’re going to try to compete against LeBron James, good luck trying to keep up with the king.